Abe Vigoda (February 24, 1921 – January 26, 2016) was an actor in both television and movie. His most well known roles are playing mobster Sal Tessio in the movies The Godfather and The Godfather: Part II, and playing Detective Phil Fish on television shows Barney Miller and Fish, Fish having been a spinoff of Barney Miller. In 1982, People magazine said that Vigoda had died, even though he did not. Vigoda took the error with a sense of humor, even appearing in a picture where he was in a coffin, holding said magazine. 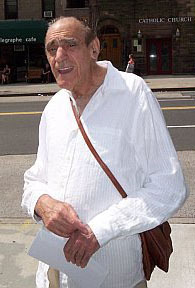 Since then, the false death information, as well as the question to whether Vigoda is dead or alive, has been used as a joke sometimes on various television shows and internet websites, including abevigoda.com, a website that says if Vigoda is alive or dead. Vigoda died in his sleep under hospice care at his daughter's home in Woodland Park, New Jersey from complications of an illness on January 26, 2016 at the age of 94. ↑ Italie, Hillel. "Abe Vigoda, sunken-eyed character actor, dead at 94". Associated Press. Retrieved January 26, 2016. This page was last changed on 1 June 2017, at 12:16.